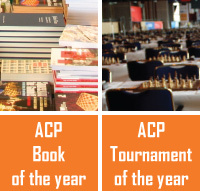 You can take part in the ACP General Assembly via this link. All Premium and Standard Members for year 2018 have the right to take part in the voting process for the General Assembly. We would also like to inform you that in view of the recent changes in FIDE and the appointment of ACP Board Members on FIDE ruling positions, we will also have an Electoral General Assembly from February 15, 2019. The deadline for submission of the applications will be February 8, 2019. On the Electoral General Assembly the members will vote for a new Board of the ACP (9 members). The Board elects among its members a President, a Board Director, a Treasurer, and a General Secretary.